Michael Bower founded Sellry, where he and his team help ecommerce and multichannel companies grow their profits. Michael lives in Fort Collins, CO with his wife and daughter. In addition to helping clients succeed he enjoys assisting nonprofits, mountain biking, trying and failing to imitate Chris Thile on the mandolin and the odd philosophical debate. 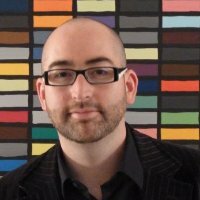 Michael tweets a few times per year at @falloutofatree, and podcasts about the top ecommerce questions at ecommerceqa.tv. Ask him yours at michael@sellry.com. John is a software developer and entrepreneur. He started Arroyo Labs to help enterprises and start ups build and scale their ideas. A veteran of multiple startups and agencies, he uses these experiences to build great software for others. John has an engineering degree from CMU and graduate degrees from Columbia and Dartmouth. Magento is a popular and robust ecommerce platform built on open source technology which comes in a free Community edition as well as a paid Enterprise edition. On November 17th, Magento released to the public a major and long anticipated upgrade to their platform. 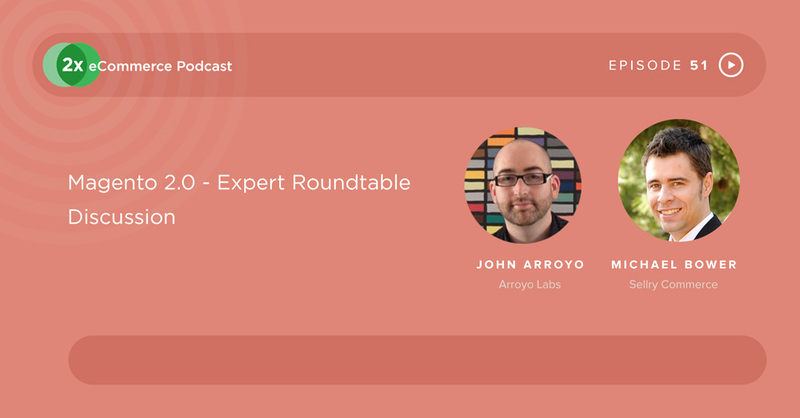 On this episode, I have a two-person panel of experts from e-commerce agencies: John Arroyo is the Founder and CTO at Arroyo Labs and Michael Bower is the CEO of Sellry. They are here to give a run-down and discussion of the new Magento 2.0 release. We begin with an exploration of Magento’s evolution and just why Magento 2 is a big deal, for some more so than for others. Magento was really at the right place at the right time when they came on the scene: people on osCommerce or other products like that were looking for what to do. The features that Magento brought to the table were surprisingly amazing for what you could get in e-commerce at that time. From a technical standpoint it has kept a lot of its original API, original ideas, and every year it’s just about making it faster, have richer features, and be less buggy. From a business standpoint it’s really transformed, especially in the last two or three years: huge ecosystem of third-party module modules, a lot more midsize and larger businesses and funded startups on the platform. One thing that eBay did help was to clean up some of the loose ends and pull the pieces together for some things about their site and support that really wasn’t Enterprise-ready. eBay Enterprise involvement took Magento from being an immature piece of software to a mature software platform that the enterprise can actually use. Evolution or Revolution: From the standpoint of the core architecture they completely changed how the application’s written. It’s actually a different application in many ways. The architecture has been completely overhauled. and it’s going to be interesting to see how that evolves because it’s a lot more in tune with the rest of say, the PHP community, the LAMP stack community. Which makes it a lot easier to do certain things and work with developers. Magento’s strength has always been the extreme modifiability of the platform and that’s why people are relying on it so much right now, because it allows you to do so many amazing things. And Magento 2 makes this even more possible, but the goal was always for future parity. So there’s definitely a lot of improvements but they’re mostly along the lines of things that will allow you to scale and enhance your store. It’s hard to say revolution just because there’s so much going on in software right now and in some ways they’re kind of ahead of the curve and some ways they’re actually still behind the curve. But for large e-commerce enterprises, they’re about making money and not necessarily about being ahead of the curve on XY and Z technology, so in that regard, they’re on track. We then look at how the significant changes to the core architecture affects speed and performance, as well as how third-party apps will be affected by the change. Magento was very forward-thinking at the time it came out. A lot of PHP developers at the time were not used to anything being written with so much structure. PHP itself has evolved quite a bit and is just a much different beast than it ever was. It’s fully object-oriented now. The performance is considerably faster, more robust. And I think that now the developer community has grown up a bit so that they can understand and take advantage of the powerful features in a system like this. Magento 2 now takes advantage of some of these good things that are going on in the community. For instance Composer being able to control packages through some sort of structured language like JSON. It’s kind of a game-changer in the LAMP community. Traditionally we had the ‘I like Magento’ vs ‘I don’t like Magento’, and I think we’re seeing that people are understanding that this is an application within the community now, and appreciating that. There’s definitely a lot of new stuff to learn. And depending on how the developers build maybe outside of Magento, they might have to rethink some of the modules. They probably have a certain way that they quickly develop XY and Z which they may have to take a step back and think of how to make it better, or integrate more in the new scheme. If they’re a developer who’s only large applications in PHP have been in Magento, it might be a little bit more of a struggle. Some of the namespacing is something that Magento hadn’t used in the past. Yet if you’re familiar with some of the more modern PHP frameworks, they all use namespaces and a lot of these newer features. Who Benefits Most – Enterprise or Community? Community, just because it makes it a viable option now. The old Community I would rarely even recommend it whereas now it’s a pretty viable option, it’s got a responsive front end and it has a lot of great things going on the backend. But it also depends on what you were doing when you were on community previously. There’s been strategies that you’ve been able to use to increase your performance significantly in the past but any merchant that wasn’t using for example full-page caching or Varnish things like that, now those things are much better supported within the application itself. Which also means less hacking moving forward: in order to get some of those features that you see in Enterprise, people would do all kinds of coddling together. An experienced developer would do it in a nice way, and an unexperienced developer could make a whole mess of the store. Now that it’s in core, you’ll see a lot better code moving forward. I think Magento really in the last few years drew a line in the sand and was like, ‘Okay, we understand it is heavier than other platforms but there’s kind of no way around it. If you want to do the things we’re doing, you’re just going to need more firepower. And if you don’t want to throw the firepower at it, you should probably try it another platform.’ So it does segment itself, but I think it has to, to be strategic. Magento is an extremely robust application. It continues to need commensurate hosting and that’s totally fine. They’ve always had a pretty open architecture but now there are possibilities to use things that weren’t even built with Magento. You could, using Composer and some PHP glue, pull in libraries a lot easier. I’ve done some headless Magento where you kind of bootstrap it from the backend. It works but it can be confusing down the road, you know, newer developers jump on and they have to kind of re-learn your custom architecture. Now you can do it in a more continuous fashion. Magento are now seeing themselves as part of the broader development community, and that’s reflected in the source code. I think that you’re going to see some interesting things along those lines where people might even be using Node for the front end and Magento the backend. And that’s been possible too, but it’s just been hard. I think the biggest gain here is going to be with regard to the database connectivity, the dependency objections, you can integrate different apps into Magento better, and all that type of thing. I think the wide range of turnkey extensions that Magento has been really popular for, thousands and thousands of extensions, it’s taking time for those to transition over to the new platform but that’s a natural progression. It will happen and very soon I think we’re going to be able to have just a ton of connectivity options out-of-the-box. Magento plus third-party apps, the ability to connect other platforms in more easily. It’s going to be a really, really great scenario. Initially you might see a bit of a shrinking of the app store and then it exploding again. And that being that there are some code modules or extensions in the community that just haven’t been maintained. I think a lot of the studios and software companies that develop these are going to have to invest some time and money to make them work with Magento 2, and that’s going to be a good thing. Because they’re going to need to weed through their own modules, see which ones are worthwhile. Some are deprecated now because it’s in core. So it’s going to probably stress them the next six months but I think the end result would be just better overall code community. There’s a lot of UX enhancements even in the backend but the thing I’m most excited about is actually the underlying stabilization and performance improvements. They’re able to get rid of some of their legacy code that was slowing it down, using more of the advanced PHP features. And that you can segment out different sections of your data set into multiple databases is a game changer if you are on the really, really large scaling side. I worked on a site years ago where they were the largest RDS instance possible, costing $10K a month, and they were still having issues that once you get to check-out, it would just crawl. Because one of the big biggest bottlenecks historically has been the database, because it can only be so big. Now they support segmented databases, you know, here are your products in one database, here’s your orders and check-out in another database. It’s been a lot of work, you know it’s hard to explain to somebody, ‘We’re going to rebuild the wheel just so you can do that.’ Now it’s a weekend hack. As e-commerce matures, every little technology piece becomes a whole industry in and of itself. And right at this point the multichannel connector space is very saturated. And there are definitely some market leaders that are going to be far outpacing anything Magento could come up with in the short term. Some of the clients that we worked with, they’re excited about it yet they don’t know what to make of it yet. It will be interesting to see, now that it seems like they are going to dedicate resources and time and user experience to omnichannel, what they come up with. I guess for me I’m kind of just going to wait and see: is it really just a marketing message or are they really going to put some firepower behind it? If it’s a new installation though, definitely an option. There are Magento 2 sites in the wild right now. And if you don’t rely on any third-party modules that haven’t migrated, you’re probably good to go. Otherwise, we’re encouraging our existing clients to wait a few months and consider May-June as their target for looking seriously at that upgrade, when there’s more extension support. But also look and see where the business is that. Are you hitting some bottlenecks, whether it’s your site’s still not responsive or you’re hitting some scaling issues or some feature issues? If you are hitting some bottlenecks, it is something you should look at sooner rather than later. On the other hand, if your site is doing well and making money, you may not want to disrupt that. Depending on your store and how old it is, it could be an expensive upgrade. Probably at the end of the day, people are going to be looking at the numbers to see if it makes sense to migrate now or later. Magento has a published document about what processes are required when doing an upgrade to Magento 2. For the store owners, Michael has podcast talking about these type of question. It’s called Ecommerce QA. it’s just a 10-minute podcast, really short and sweet. But we go into this type of question very extensively and we’re going to be releasing an episode on this topic shortly following the show. This episode is brought to you by Remarkety. Remarkety is an email marketing platform specifically built for eCommerce businesses. With Remarkety, emails are automatically triggered by shopper behavior and purchase history. With a few simple clicks, Remarkety allows you to recover abandoned carts, win back inactive customers, make product recommendations, deliver newsletters, and a whole lot more. In other words, emails you will send through Remarkety will be highly targeted, with glaring improvements on your open rates, click rates, and most importantly, conversions. You are also able to track revenue generated from every single email sent by Remarkety. Try Remarkety absolutely free for 30-days. No credit cards and no contracts. To sweeten the deal, 2x eCommerce listeners can get Remarkety for 30% OFF an entire year using the coupon code PODCAST30. Visit Remarkety.com to learn more. Remarkety is email marketing for e-commerce, simplified. Kunle: Do you listen to the 2X e-Commerce Podcast Show, or is this the first episode you're actually listening to? If you do enjoy the show, or you have feedback of any kind, the best way to provide that feedback, good or bad, is by leaving us a review on iTunes. It helps a ton with our rankings exposure and downloads. In most importantly gives me feedback on the value I endeavor to drive with each episode I publish here. So go ahead and leave this show a review, in under a minute guys, please, and girls, on iTunes. Now back to the show. Hi 2Xers! Welcome to the 2X e-commerce podcast show and I'm your host Kunle Campbell. And this is the 2X e-Commerce Podcast Show dedicated to rapid growth in online retail. Now if you're looking to scale/grow you're in the right hands because I bring in the experts. I bring in the up entrepreneurs who can help grow your stores and improve metrics such as conversions, average order value, repeat customers, traffic, and ultimately sales. Speaking of today's show, I'm going to be speaking with two experts, Magento experts actually, who are going to talk to me very much about Magento 2.0. Magento released Magento 2.0 on the 17 November. And if you're listening to this show and you run a Magento site, you'd be thinking, 'Hmm....should I upgrade?' Because I've had some conversation with clients actually who said, 'No, I'm not going to upgrade till, I don't know, six-month time,' or 'No, I'm not going to upgrade till a year. It's a ground-up upgrade, everything we've built is is pretty much going to need rebuilding.' And that really brought some questions to mind in regards to the fact that if they're that skeptical about an upgrade... I guess it's the work required for an upgrade, should I have some conversations with experts about it, about what Magento has done and if it's worth it and how quickly you should. So I fished out some experts and I got two really top guys who know what they're saying in the industry. One is Michael Bower, he's the CEO of Sellry, the Colorado-based e-commerce development agency that work largely in Enterprise, with Enterprise. They both largely work with Enterprise clients. And then there's John Arroyo, he's the founder and CEO of Arroyo Labs. Now they both have a combined experience of well over 10 years with Magento. And they're here to pretty much give us the ins and outs of Magento 2.0 as a platform and also tell us when to upgrade. Because you know the holidays are just around the corner, obviously it's going to take months, it's not a single one-day or one-hour click on a button upgrade for you guys. So yes, we're going to go through everything you need to know with regards to Magento 2.0. So yeah, welcome to the show Michael and John. Hi guys welcome to the 2X e-commerce podcast show and this is a special one. I'm speaking with experts about Magento's release, this Magento 2.0, which was released on 17th of November just last week. I have two experts with me. I have Michael Bower, he's the CEO of Sellry in Colorado in the United States. 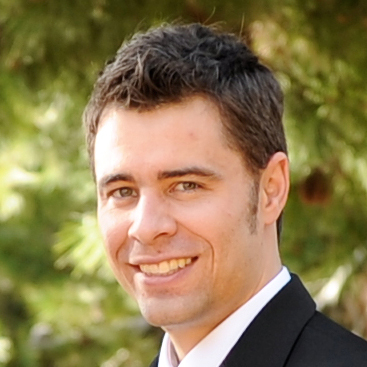 And John Arroyo, he is the Founder and CTO of Arroyo Labs in Los Angeles. I'd like to welcome you both to the show and could you take about 30 seconds to introduce both yourselves, please? Starting with John. John: Oh, sounds good. So I'm John Arroyo, Founder and CTO of Arroyo Labs. I've been using Magento for I guess about five or six years now. Starting out at another agency, then doing some heavy customization and scaling at a startup, before going out on my own, starting my own firm and then starting to build a team. Kunle: Brilliant. Brilliant. And Michael, could you introduce yourself please? Michael: Absolutely. Thanks for the opportunity to be on the show. I would call myself an e-commerce junkie. I've had a lot of experience working in startups originally and then just always gravitated to the marketing technology side. And went independent, started my own gig back in 2009 and shortly after that got into Magento. So we're up to seven full-time staff, got four different Certified Plus developers and just growing and growing. Kunle: Interesting, very, very interesting. So you guys have been pretty much around through Magento. I think Magento was launched in 2008 I believe. There's been an evolution really, over time. So let's talk about the kind of clients each of you work with, starting with John. Do you work predominantly with Enterprise clients, Community edition of clients, or a bit of both? What's your client base like? John: Yeah, you know we tend to work more with Enterprise, midsize or larger businesses. We do work a lot with startups but more and more we're finding they're not interested in Magento or it's too big of a platform for them. But there is kind of a sweet spot with large enterprise where they need all these different bells and whistles and ability to extend and plug-in to legacy systems. But we've worked with clients like Peet's Coffee and K-Swiss, Brighton Collectibles' one of our current clients. They're all in Enterprise and have some pretty extensive customizations. Kunle: Interesting, interesting. And Michael, what's been your experience, what kind of clients to you guys work with in Sellby? Michael: Absolutely. So in our 10 years since 2010 starting out with the platform, we've focused primarily on a particular market segment. We service primarily high-traction startups and multichannel companies in healthcare, medical, dental, natural living, kind of that type of the vibe. I live in Colorado so there's a very strong emphasis on healthy living, sustainability. We do service all versions of Magento, even the Pro version back in the day if you can remember that. Kunle: Interesting, interesting. And I suppose your clients are national, both of you, or what is the case? Do you work with local clients or national, international clients? Michael: If you're asking me, we definitely have an international reach. Since day one we've always focused on the niche that we're servicing all around the world and that's what we're doing now as well. Kunle: Okay, fantastic. Right, let's talk about the evolution of Magento from its beginning. You know, I've never heard of Magento Pro, by the way. So let's talk about the evolution and progress of the platform. In your opinion John, how do you think Magento has evolved over the last... they started in 2008 I believe, if I'm wrong please correct me. So what are your thoughts on the progress of Magento? John: It's become interesting. From a technical standpoint it has kind of kept a lot of its original API, a lot of its original ideas, and every year it's just about making it faster and richer features, less buggy if you will. From a business standpoint, I think it's really transformed. Huge ecosystem of third-party modules, a lot more midsize and larger businesses on it, a lot of funded startups that have been on the platform. And I think that was kind of more in the last two or three years. Kunle: Interesting. Yeah, please chime in Michael. Michael: Yeah, I'd totally agree with what John said. I think Magento was really at the right place at the right time when they came on the scene and just, people were looking for what to do, if they were on osCommerce or other products like that. And the features that Magento brought to the table were just really surprisingly amazing for what you could get in e-commerce at that time. And I think that they've done a really good job of maturing the platform and I think that now a lot of us in the development community are really excited at what's happening with Magento 2. Kunle: Okay. We're going to talk about Magento 2 shortly. What do you think about eBay's acquisition of Magento? Did it help? From a business standpoint, did it help the business or do to think Magento had seen a lot more progress without eBay? John: Actually, I'll jump on that one. It's been interesting, I always felt it was a weird pairing but one thing that it really did help out, at least maybe the first couple of years, was to clean up some of the loose ends or some of the... you know there were things about Magento, about the site, about their support that really wasn't Enterprise-ready. And I think eBay really helped them pull those pieces together. From a technology standpoint, I think there was probably a year where there was a lot of muddiness, didn't know where they were going, EBay didn't know what to do with them. And ironically after they kind of got their act together, that's when eBay had decided to split them off. But moving forward, that's probably best. So in the long run having that eBay experience will probably help them. John: Totally agree with what John just said. I think that eBay Enterprise involvement took Magento from being an immature piece of software to a mature software platform that the enterprise can actually use. Kunle: And do you see Magento actually... from the announcement it seems like Magento's really trying to break grounds in the Enterprise, in Enterprise in general, with announcements such as omnichannel support and the like. So let's talk about November 17th. Magento's press release described it as a new era of commerce innovation. In your opinion, was it groundbreaking? Was it more like an evolution, small change, or a revolution in their platform? John: I almost see more of an evolution than a revolution. I think if they had come to market closer to when they maybe initially wanted to, it might have been more of a revolution. But at this stage in the game it's just a big jump versus their other releases. Definitely a step in the right direction. It's hard to say revolution just because there's so much going on in software right now and in some ways they're kind of ahead of the curve and some ways they're actually still behind the curve. But for large e-commerce enterprises, they're about making money and not necessarily about being ahead of the curve on XY and Z technology, so in that regard, I think they're on track. Michael: Yeah, I kind of would agree with that too. I think Magento's strength has always been the extreme modifiability of the platform and that's why people are relying on it so much right now, because it allows you to do so many amazing things. And Magento 2 makes this even more possible, but the goal was always for future parity. So there's definitely a lot of improvements but they're mostly along the lines of things that will allow you to scale and enhance your store, if that makes any sense. Michael: I don't know if I would say it's so much incremental from the standpoint of the core architecture. Michael: But in terms of features, yes, I would say that it's not focused on new features; it's focused on a new basis. Kunle: So does that mean the architecture has been completely overhauled? Kunle: Now let's talk about the certain things. So you guys obviously connect lot with other PHP developers and Magento developers most especially. What have conversations been like from Magento developers? Let's talk about the PHP and these core changes that have been implemented. John: Yeah, that's been pretty interesting in itself. PHP itself has evolved quite a bit since I've started working with it. It's just a much different beast than it ever was. It's fully object-oriented now, the performance is considerably faster, more robust. Magento 2 now takes advantage of some of these good things that are going on in the community. For instance Composer being able to control packages through some sort of structured language like JSON. It's kind of a game-changer in the LAMP community, it's definitely going to be a big plus I think with Magento. Michael: I think Magento was very forward-thinking at the time. I mean they basically, the people architecting it, they basically took the pattern of a big enterprise job application and built it into this PHP application that a lot of PHP developers at the time were not used to anything being written with so much structure. And I think that now the developer community has grown up a bit so that they can understand and take advantage of the powerful features in a system like this, which I think is great. Michael: Like an example would be that just the ability to do things like dependency injection. I mean that's huge. John: Yeah and I think Magento was definitely ahead of the curve on that front. I mean there are things that as developer digging around the code I wouldn't have thought to do with PHP. It's [inaudible 00:17:01] in JAVA but I thought PHP couldn't handle it. Michael: Very, good point. Yeah, it's really funny how Magento did that because it was forward-thinking and I think it helped a lot of people move forward although it was hard for some types of developers to understand. Traditionally we had the 'I like Magento', 'I don't like Magento', and I think we're seeing that people are understanding that this is an application within the community now, and appreciating that. 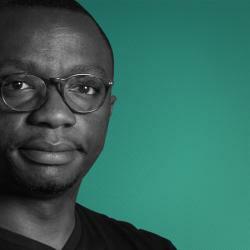 Kunle: I sense Magento actually pushed the PHP world or community and standards higher. Is that a good enough deduction, or? Michael: I kind of think the community moved forward of its own accord and maybe took inspiration from Magento or maybe it was the other way around but the community now is a much better community than it was when Magento was just coming out. Kunle: Okay, okay. Well this new architecture, what about developers? Are developers having to relearn PHP or Magento? Will Magento developers need to relearn Magento because it's fully new architecture, will they need to take their certification exams again or you know the study the source code again? Or if they were quite familiar with the old one, would be would it be more like an upgrade of an iOS you know from in a consumer standpoint? I'm not a developer by the way, but would it be more like a new iOS has come out so it's much better to use rather than having to relearn it from scratch again? John: I think they can kind of pick up where they left off. There's definitely a lot of new stuff to learn. And depending on how the developers build maybe outside of Magento, they might have to rethink some of the modules. It's not going to be as go-to. I mean they probably have a certain way that they quickly develop XY and Z. They may have to take a step back and think of how to make it better, or integrate more in the new scheme. If they're a developer who's only large applications in PHP have been in Magento, it might be a little bit more of a struggle. Some of the namespacing is something that Magento hadn't used in the past and a lot of other frameworks don't use even today. Yet if you're familiar with some of the more modern PHP frameworks, they all use namespaces and a lot of these newer features. Michael: I'd agree with that. Kunle: Okay, okay. All right. Cool. I suppose both of you have taken Magento version 2.0 on test drive? Michael: Absolutely. It's funny though because you know there's been so many releases and they keep adding things in and changing it around. John: Yeah, it's been kind of an interesting progression you know, just kind of a hidden repo at one point and then kind of slowly evolved. Kunle: All right. And the most stable version was made to public on the 17th of November. Have you both had a test drive of this final version on some staging server or even a live...? Have any of your clients actually upgraded, taken the leap to upgrade? John: Yeah, I've played with the demo which I believe is pretty current, it's probably just behind the one that was just pushed out. Besides downloading the code, I haven't actually looked at the final launch version. I think the last time I looked under the hood has probably been a month ago. Michael: Yeah, same as me. I think they locked the features back then so it shouldn't be new stuff. I think that Magento 2.0, it's very focused on core architecture changes. I mean the new theme that they're offering out of the box is great, I love it; you know there's a lot of UX enhancements even in the backend but the thing I'm most excited about is actually the underlying stabilization and performance improvements. Kunle: Okay, okay. We're going to talk about that. So what about the admin overhaul? Did they impress you? John: Yeah, that's nice. It's definitely a big move forward. Michael: They weren't originally going to do it responsive and I'm really glad that it ended up being responsive. I mean that's just like a really basic thing, I think. Kunle: Okay, so it means we can ask a manage our stores from mobile phones, which is fantastic. Okay, all right, good. Who stands to benefit more from this upgrade: Enterprise or the Community edition users? John: That's a really good question because my first instinct was to Enterprise, but I think it's actually Community. I think Community, just, it makes it a viable option now. The old Community I would rarely even recommend it unless they just did not have the budget for it. Now it's a pretty viable option, it's got a responsive front end, it has a lot of great things going on the backend. But with Enterprise, there's some new scaling efforts that for really large enterprises, they're able to use multiple databases. That's kind of a game changer for some players. Michael: Yeah, I totally absolutely agree with that. I think the, you know it depends on what you were doing when you were on Community previously. There's been strategies that you've been able to use to increase your performance significantly in the past but any merchant that wasn't using for example full-page caching or Varnish things like that, now those things are much better supported within the application itself. So yeah, and then like John said, obviously the enterprise-grade features are going to be really important for Enterprise customers. Kunle: Okay, so I suppose there's less, well, there will be fewer hacks? John: I think that's a great point because there's a lot of third parties. Some of them are great, some of them you want to stay very clear from. And in order to get some of those features that you see in Enterprise, people would do all kinds of coddling together. An experienced developer would do it in a nice way, and an unexperienced developer could make a whole mess of the store. Now that it's in core, you'll see a lot better code I think moving forward, hopefully. Kunle: Hopefully, okay. That's quite interesting. And what about the big issue. A lot of people complain about hosting and performance in general, you know if you don't have the right firepower as well as good developers with good code architecture, you could mess up your store and just reduce it in terms from the speed standpoint. What are your thoughts on how well it supports basically hosting? Do you still need to do the whole rack space or get decent hosting in place for Magento Community edition? John: Yeah, I think you do and at some point you know I even chimed in that argument. I was like, 'Oh, why is it so heavy,' and this that. But when you take a step back, you realize what you're trying to do, how you trying to do it, it just makes sense to have more firepower. And if you don't want to take that jump, it's probably not a good platform for you, you might want to try something else. I think Magento really in the last few years drew a line in the sand and was like, 'Okay, we understand it is heavier than other platforms but there's kind of no way around it. If you want to do the things we're doing, you're just going to need more firepower. And if you don't want to throw the firepower at it, you should probably try it another platform.' So it does segment itself, but I think it has to, to be strategic. Michael: And I think it's totally fine that it segments itself. I mean Magento is an extremely robust application. It needs commensurate hosting and that's totally fine. I mean think about... you don't want to be the guy who's on the $2 a month hosting plan, ever. I mean what's that akin to, always using the cheapest version of everything with your most important asset, which is your business? Nobody would ever do that. If you really calculate how much of your overall spend hosting is, it's really not that big of a number most of the time if you're doing anything right. I'm really excited about the performance improvements in Magento in the last...I think you know the ability to improve performance by 50% is insane. Not everybody will be able to do that depending on what they've already done with performance and optimization-wise but just out-of-the-box performance being faster is a huge boon. Kunle: Okay. Speaking of performance, what are your thoughts on this open, flexible architecture? From press releases they talked about it being more modular and they have extensive APIs with a range of turnkey extensions. Is this marketing hype or a genuine claim? John: I think it's legitimate. They've always had a pretty open architecture but now there are possibilities to use things that weren't even built with Magento. You could, using Composer and some PHP glue, pull in libraries a lot easier. It still may not fully integrate with core but depending on what you're doing, it could work out well. I've done some headless Magento where you kind of bootstrap it from the backend. It works but it can be confusing down the road, you know, newer developers jump on and they have to kind of re-learn your custom architecture. Now you can do it in a more continuous fashion. John: Absolutely. And I think that you're going to see some interesting things along those lines where people might even be using Node for the front end and Magento the backend. Michael: Exactly. And that's been possible too, but it's just been hard. John: Yeah. It's been a lot of work, you know it's hard to explain to somebody, 'We're going to rebuild the wheel just so you can do that.' Now it's a weekend hack. Kunle: So am I sensing you could pretty much use a Magento backend to power app, a shopping app, easier now with the architecture? Kunle: The Magento backend with an iOS app? Michael: Yeah, I mean that's always been possible. I think the biggest gain here is going to be with regard to the database connectivity, the dependency objections, you can integrate different apps into Magento better, and all that type of thing. I think the wide range of turnkey extensions that Magento has always been able to... been really popular for, thousands and thousands of extensions, it's taking time for those to transition over to the new platform but that's a natural progression. It will happen and very soon I think we're going to be able to have just a ton of connectivity options out-of-the-box. Magento plus third-party apps, the ability to connect other platforms in more easily. It's going to be a really, really great scenario. Kunle: What are your thoughts on the new architecture's effect on they are extensions marketplace? Is it going to resemble more of an apps marketplace? Is it going to evolve basically with the platform? How are third-party extensions going to actually work? My second question also has to do with the fact that, well, a lot of Magento clients or people who use Magento could install an extension in several instances. And that installation might either not even work until a hack is implemented or it might have affect another installation. Does this more modular architecture actually help? John: It's going to be, one thing's going to be interesting: I think initially you might see a bit of a shrinking of the app store and then it exploding again. And that being that there are some code modules or extensions in the community that just haven't been maintained. They kind of worked with older versions and haven't really been touched in a while. I think a lot of the studios and software companies that develop these are going to have to invest some time and money to make them work with Magento 2, and that's going to be a good thing. Because they're going to need to weed through their own modules, see which ones are worthwhile. Some are deprecated now because it's in core. So it's going to probably stress them the next six months but I think the end result would be just better overall code community. Kunle: Okay. Michael, what are your thoughts? Michael: Yeah, I totally agree with that. I think that that whole pruning effect when you make a significant change on the platform, that is a good thing for your app store. I don't actually know whether Magento's going to change the model, they haven't been fully upfront about what they're going to do. Other e-commerce platforms have taken different approaches with their app stores and there's a possibility of some changes there but the point is that merchants will still be able to get high-quality modules going forward. Kunle: Okay. So this is just upping the game, really, from a modular and extensions standpoint. Okay. What about Enterprise-grade scalability and performance. Magento claims, and you just allude to the fact, that page load times on catalogue and checkout pages are 50% faster. It's amazing. What are your thoughts on that? Is this just in a controlled environment or would this be for real? John: You know from what I've seen of what they've done under the hood and I was at the Magento conference this last year in Vegas and went to some of the talks on what they've done and it makes sense that it's this much faster. They're able to get rid of some of their legacy code that was slowing it down, using more of the advanced PHP features. What's really interesting from an architecture standpoint, the fact that you can segment out different sections of your data set into multiple databases is a game changer on the really, really large scaling side. Most people aren't going to leverage that but if you are in a state where you need that, that could be a big boost. Because one of the big biggest bottlenecks historically has been the database. No matter what you throw at it, once it hits the database... I've worked on sites where you hit a brick wall. You know you can't go anywhere. You can only get database so big. They don't support multiple masters. Now they support segmented databases, you know, here are your products in one database, here's your orders and check-out in another database. Yeah, that, from an architecture standpoint it's kind of it game changer. Kunle: It's pretty neat, splitting up data sets by database. And I suppose that would reflect in the cost of architecture in a cloud environment where various instances would be and handling various databases. John: Yeah and I worked on a site years ago where they were on the Amazon cloud, they had the largest RDS instance possible, you know really, it is 10 grand a month. It's come down considerably in price at this point. And they were still having issues that once you get to check-out, it would just crawl. There was only so much you could do to speed it up. Now I think it would, if they had that back then they wouldn't have that issue. Michael: [laughs] Well this has always been the joke with Magento, that Magento's out-of-the-box six second page load is unacceptable. And you know so developers have figured out ways to make things much faster: four seconds, two seconds, one second. But I mean so there's kind of two levels. There's the out-of-the-box plain Jane Magento now is actually fast. Which is huge. And then like John was saying you have all of these more hard-core optimizations that you can do on the database level in various places related to the code. I would say that if you're already running a highly optimized Magento instance, you're probably not going to get 50% performance improvement just by upgrading to Magento 2. But you'll probably, you know, you'll get 10 – 20% perhaps. But if you're not doing any of that stuff, by definition you going to be at least 50% faster. Kunle: Not bad. Not bad at all. Okay. What about omnichannel? This is really experiences you know, merging off-line experiences with digital experiences. And bringing mobile, retail, High Street experiences all together. And Magento claims to have omnichannel features. Anything to be excited about? It just, to me sounds like the foray into Enterprise. What are your thoughts? And you guys work with Enterprise clients and are they excited about these omnichannel features or do we still have a long way to go? John: Yeah I think that this one, it's one of those things I think at least some of the clients that we worked with, they're excited about it yet they don't know what to make of it yet. There's been a lot of talk amongst a lot of e-commerce platforms and even Magento about omnichannel. In practice it's been a lot of custom work and you're basically re-creating your own channels on top of Magento. So it will be interesting to see, now that it seems like they are going to dedicate resources and time and user experience to omnichannel, what they come up with. I guess for me I'm kind of just going to wait and see: is it really just a marketing message or are they really going to put some firepower behind it? Kunle: Okay. Interesting perspective. Michael what are your thoughts? Kunle: Okay, okay. All right, so to me that still something to think about, really, with regards to...so I'll just leave it to be open for the time being. Okay, now let's talk about upgrading. We're in the middle of... today's 20th of November, listeners will probably be listening to this on 24th of November, and the holidays are about the kickoff. There's Thanksgiving in the US coming up followed by Black Friday and the Cyber Monday. Should retailers attempt to upgrade now? [laughs] Or just wait till the new year? John: [laughs] No. I don't think it's recommended. I don't even think Magento is really pushing that. But the timing, for them, they're probably telling clients, 'Hey, start the process now, it might take you two or three months. By the time the holidays are done, you have this parallel site you can launch in January - February.' If it's a new installation though, definitely an option. If you don't rely on any third-party modules that haven't migrated, you're probably good to go. Kunle: It's good timing, okay. Michael: Yeah, we're encouraging our existing merchants on Magento 1X to wait a few months until there's more extension support. However we are actually preparing to do our first Magento 2 build right now so we're really excited at the fact that the software is available now. We were waiting a long time for it. Kunle: Interesting, interesting. Okay so, guys, listeners, just hold fire till the new year. Okay so, any parting piece of advice or recommendations to people on 1.X looking to upgrade? Michael you alluded to just now that they should just wait to the extension market is more mature. So should they kind of wait for version 2.1 or 2.2 when all the obvious bugs have been taking care of? Or what are your thoughts? Starting from you John, please. John: Yeah, I think it's one of those things where really look and see where the business is that. Are you hitting some bottlenecks, whether it's your site's still not responsive or you're hitting some scaling issues or some feature issues? If you are hitting some bottlenecks, it is something you should look at sooner rather than later. If your site is doing well, it's making money, you may not want to disrupt that. I think it could, depending on your store and how old it is, it could be an expensive upgrade. Personally I always like playing with the latest and greatest so a little keen to migrate faster, sooner rather than later. But I think probably at the end of the day, people are going to be looking at the numbers, see if it makes sense to migrate now or later. Michael: I think you touched on something important, John. Magento 2 is a very significant upgrade. In fact I would actually consider it more of a migration than an upgrade. Magento has a published document which maybe we could put it in the show notes about what processes are required when doing an upgrade to Magento 2. So I agree with John that if you're the type that once worked latest and greatest, have the best user experience possible, you should. You are going to move to Magento 2, period. It's going to happen. When that happens, you know, that's more of the question. We're encouraging our clients to consider May-June as their target for looking seriously at that upgrade. I don't know that there's a dot release that is an important target there, I think it's more like when the preponderance of your third-party extensions are supported, or even maybe slightly before that, that's when you want to really look at that. But there are Magento 2 sites in the wild right now and probably put a link in the show notes to some of them. So this is a real solution, this is not beta software, this is a real release and merchants are going to be wanting to switch to it. Kunle: Okay, in addition to the published migration notes from Magento and the examples you're going to share, are there any other resources and online listeners...okay, so listeners to the show are typically e-commerce owners, so founders and e-commerce managers. So for an e-commerce manager for instance managing a site, are there any definitive resources besides the Magento blog and Magento website they can check out to help just ease upgrade process? John: That's a good question. From the business side, I'm not sure of any really good resources on that. From a developer's side, Alan Storm has historically been a great resource for Magento folks and a lot of people who come from other platforms and learn it, they end up learning it through his tutorials versus actual official Magento tutorials. Michael: Magento has always been very developer-centric and I think that's been a great thing for the community. For the store owners, I kind of gravitate to them more given my background and just the challenges of growing e-commerce stores. So I actually have a podcast where we talk about these type of questions and this past question in specific. It's called Ecommerce QA. John: Yeah, it's just a 10-minute podcast, really short and sweet. But we go into this type of question very extensively and we're going to be releasing an episode on this topic shortly following the show. So if you want to go to EcommerceQA.tv, there's going to be some resources there. Kunle: Okay, we'll definitely link to Ecommerce QA from the show notes. Kunle: To find solutions, right, yeah. Kunle: Absolutely. Leave it to the experts. Okay. Finally, how can our audience reach out to you? What's the best way? Social media, email, website, please? John: Yeah, I think all the above. Twitter is great you know we're just Arroyo Labs twitter @RoyalLabs. Or our website ArroyoLabs.com. Kunle: Brilliant, we'll link to it in the show notes. Michael, please? Kunle: [laughs] All right. It's been an absolute pleasure having you both on the show and thank you for coming up on the 2X eCommerce Podcast. John: Thanks for having us. Thank you 2Xers for sticking to the very end of today's episode and hope you found Michael and David's [John's] view on Magento 2.0 helpful with regards to deploying Magento 2.0 on your Magento site. And if you're planning on building out a new Magento-based website, they've provided concrete and sufficient info on how to go about it, I hope. To download the show notes and read the full transcript, head over to 2XeCommerce.com. And if you have any feedback, if you have any comments, just drop us a comment on 2X eCommerce.com on the particular post, on this episode and also finally if you haven't left us a review, please don't forget to leave us one iTunes. It only takes about a minute and that minute goes far. That's another growth lever point. So you're giving that one minute to us and we grow from an audience standpoint, we go up the rankings on iTunes. We not only go grow go up the rankings on iTunes, we get more downloads. That gives me more motivation to keep the show's going. So if you like it, just take out one minute please, if you haven't. For updates and tips to help you grow your store, be sure to sign up to our email news alert over on 2X eCommerce.com. Just go to any form that comes, there might be pop-ups, popovers, some of you might find annoying or you know the sidebar sign-up boxes. Just sign-up anywhere on the site. And I will send webinar updates that genuinely help you with tips to grow your stores, your business, basically, your online retail business. So until the next show, do have a really, really good weekend. Bye.